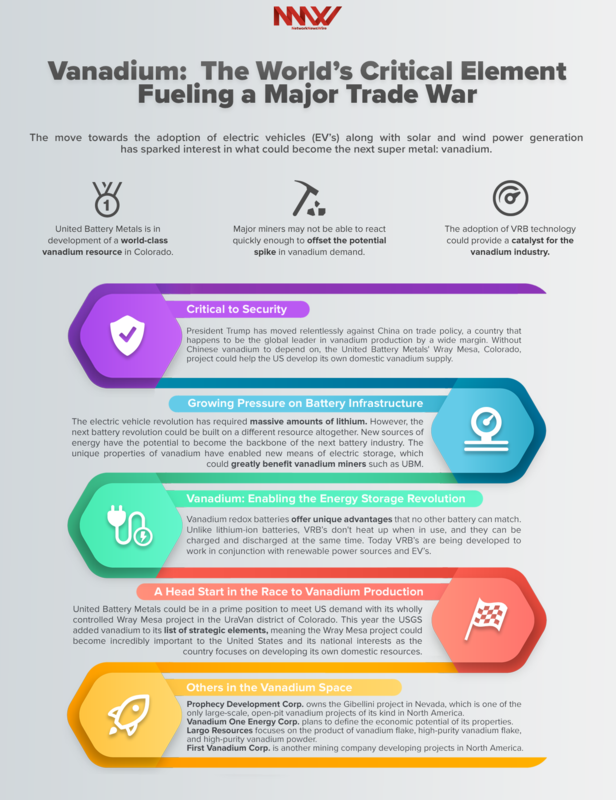 NetworkNewsWire Editorial Coverage: The move towards the adoption of electric vehicles (EV’s) along with solar and wind power generation has sparked interest in what could become the next super metal: vanadium. The United States doesn’t currently produce vanadium; however, United Battery Metals (OTC: UBMCF) (CSE: UBM) (FWB: 0UL) (Profile) is in development of a world-class vanadium resource in Colorado. The vanadium redox battery (VRB) is a potentially revolutionary way to store energy, and major miners such as Largo Resources (TSX: LGO) (OTC: LGORF) may not be able to react quickly enough to offset the potential spike in vanadium demand. The adoption of VRB technology could provide a catalyst for the vanadium industry, a positive for companies such as Prophecy Development Corp. (TSX: PCY) (OTC: PRPCF), Vanadium One Energy Corp. (TSX.V: VONE),and First Vanadium Corp. (TSX.V: FVAN) (OTC: CCCCF), which are eager to serve this growing marketplace. The Department of the Interior deemed vanadium as one of the commodities considered critical to the economic and national security of the United States. This recognition is a result of President Donald J. Trump’s executive order to break America’s dependence on foreign minerals. President Trump has moved relentlessly against China on trade policy, a country that happens to be the global leader in vanadium production by a wide margin. Without Chinese vanadium to depend on, the United Battery Metals’ (OTC: UBMCF) (CSE: UBM) Wray Mesa, Colorado, project could help the US develop its own domestic vanadium supply. The price of V2O5 vanadium pentoxide flake 98 percent, a common form of vanadium, has increased significantly over the last three years. The global shift toward EVs is growing stronger. According to Forbes, China is subsidizing the purchase price of an EV by as much as $10,000 per vehicle. Beijing wants to curb its dependency on dirty fuel sources, which has required the government to slash the number of new vehicle registrations allowed in Beijing this year from 150,000 to just 100,000. Of those 100,000, 60 percent must be an EV. Vanadium redox batteries offer a potentially game-changing solution for stationary storage units and charging stations. Unlike lithium-ion batteries, VRBs can be charged and discharged simultaneously, allowing up to 50 vehicles to connect to VRB charging stations at the same time. This means the trend towards EVs could require significant amounts of vanadium in the form of charging infrastructure to provide energy to these new vehicles. Until recently the steel industry used the majority of the vanadium supply as an additive to strengthen steel. Demand in the steel industry continues to grow, thanks in part to the current administration’s support of domestic steel production, which has caused companies such as US Steel to open new facilities and cancel plant closures nationwide. Now it looks like vanadium could be vital for cutting-edge battery technology in addition to being a steel additive. There are currently no active vanadium producers in the United States, meaning United Battery Metals could have a head start in development, thanks to its 3,000-acre land package in Wray Mesa. In addition to the steel industry and car charging stations, VRB’s could play a critical role in grid power storage. Solar and wind power nationwide is a burgeoning industry that is growing exponentially with a shift to clean energy solutions. California has recently announced that by 2020 all homes and mid-rises will be required to install solar panels. It is here that VRBs can play a part. The ability to store power from low-usage periods and spill it back into the grid during peak demand periods makes VRB’s a far superior choice for large-scale energy storage than lithium-ion batteries. Experts predict that it is just a matter of time before this law will be adopted nationwide. Regulations such as these could become a big driver for vanadium demand in the United States, a country in desperate need of a domestic resource. EV’s offer society an incredible transportation option that could drastically reduce carbon emissions. As the shift towards EV’s continues, a new network of charging stations could be necessary to provide the vehicles with electricity. With multiple governments already moving to regulate internal combustion engine vehicles, the move towards electric transportation has already begun, meaning the race is on to create the energy infrastructure necessary to support these new electric vehicles. The electric vehicle revolution has required massive amounts of lithium to produce the lithium-ion batteries found in EV’s such as the Tesla. However, the next battery revolution could be built on a different resource altogether. As energy demands grow and the lithium-ion battery becomes as common as the lightbulb, new sources of energy have the potential to become the backbone of the next battery industry. In the case of vanadium, the unique properties of the metal have enabled new means of electric storage, which could greatly benefit vanadium miners such as UBM. Vanadium redox batteries offer unique advantages that no other battery can match. Unlike lithium-ion batteries, VRB’s don’t heat up when in use, and they can be charged and discharged at the same time. Today VRB’s are being developed to work in conjunction with renewable power sources and EV’s. Unfortunately, there isn’t currently enough vanadium in production to meet growing demand. For United Battery Metals, the vanadium supply crunch in the United States offers a potentially lucrative opportunity. The company has a large land package in a politically stable jurisdiction, and its Wray Mesa project has the potential to become the lone vanadium producer in the country. VRB’s also solve a common problem for sustainable power sources, offering an almost perfect solution for storing power at stationary power stations. They offer a long service life and can be recycled when they need to be replaced. VRB’s can also charge and discharge simultaneously, meaning a VRB-based power station could be capable of charging itself through the grid while also providing energy to vehicles or other devices. According to Forbes, the number of EV’s sold globally is expected to increase from 1.2 million in 2017 to 2 million in 2019. This trend could also greatly benefit vanadium miners such as United Battery Metals, which are capable of providing enough of the super metal necessary to jumpstart the next battery revolution. United Battery Metals could be in a prime position to meet US demand with its wholly controlled Wray Mesa project in the UraVan district of Colorado. This year the USGS added vanadium to its list of strategic elements, meaning the Wray Mesa project could become incredibly important to the United States and its national interests as the country focuses on developing its own domestic resources. Wray Mesa has a chance to become the next major source of vanadium in the United States. According to a 43-101 prepared in 2013, Wray Mesa is sitting on an estimated resource of 2,640,000 pounds of vanadium. The property is also close to the town of La Salle, which has access to established roads, and municipal water only six miles away. With a global scramble to lock down large amounts of high-grade vanadium taking place, UBM could be in an optimal position to capitalize on the trend. The UruVan district has a history of producing both uranium and vanadium, with a number of small mom-and-pop mines populating the area. Colorado is also a mining-friendly jurisdiction with a solid track record of protecting resource investments. United Battery Metals has put together a land package that has an estimated resource of more than 2.6 million pounds of vanadium; However, the resource model the company used is based on exploration results that likely understated the resource. Very little modern drill work has been undertaken in the UruVan district, meaning there could be a lot more vanadium waiting to be found during exploration. Most of the elements that will drive the shift away from carbon-heavy power are in short supply. Metals such as vanadium and cobalt have been an afterthought to industry for decades; however, lately the price of these vital elements has been exploding. Prophecy Development Corp. (TSX: PCY) (OTC: PRPCF) owns the Gibellini project in Nevada, which is one of the only large-scale, open-pit vanadium projects of its kind in North America. The project is currently undergoing EPCM and EIS preparation and could be the right project at the right time. Vanadium One Energy Corp. (TSX.V: VONE) is a mineral exploration company whose mandate is to acquire vanadium and manganese mineral projects within North America. The company plans to define the economic potential of its properties, define end markets, and process and refine raw materials onsite to create a closed-loop supply chain with end users. Largo Resources (TSX: LGO) (OTC: LGORF) is a strategic mineral company focused on the product of vanadium flake, high-purity vanadium flake, and high-purity vanadium powder. One of the lowest cost producers of V205, the company currently operates the Maracás Menchen Mine in Brazil, an open pit mine that boasts consistent, robust production rates. First Vanadium Corp. (TSX.V: FVAN) (OTC: CCCCF) is another mining company developing projects in North America. The company is working to catch up with vanadium demand through its Carlin project in Nevada. The Carlin project was originally discovered by Union Carbide Corp. in the 1960s, including 127 rotary drill holes that have systematically defined near surface shallow dipping deposits. First Vanadium is also exploring a copper project just outside of Jerome, Arizona.